Convert standard 2D videos to 3D videos as a perfect 2D to 3D Conversion software. Convert format between kinds of 3D movies. Convert 3D videos to standard 2D videos. Support outputting Red/Cyan Anaglyph 3D video format, so you can enjoy 3D effect on a standard 2D TV; also support Side-by-Side 3D and Top and Bottom 3D. Support all kind of popular video formats like H.264/MPEG-4, AVI, MPEG, WMV, MP4, FLV, MKV, DivX, XviD, MOV, RM, RMVB, TS. Work well with iPad, iPhone, PS3, Apple TV, Xbox and other smart phones. 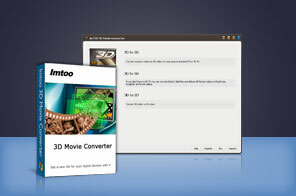 More than just a 2D to 3D conversion software, with ImTOO 3D Movie Converter, you can enjoy the unbelievable 3D videos on a standard 2D TV even without 3D TV, since Red/Cyan Anaglyph 3D video format is one of the output files. Also, it works well with iPad, Apple TV, PS3, Xbox, iPhone, iPod, PSP, General mobile phone, BlackBerry, General MP4 players, Android mobile devices and Windows Mobile devices. Makes full use of your standard TV with outputting Red/Cyan Anaglyph 3D video format which doesn’t require 3D TV or player. How to convert video using a custom profile? How to transfer iPhone messages to computer? How to add music to video?